Have a big group, book the MegaCycle for a private tour. Have a small group, choose the “Book a Seat” option. Not sure what option is best for your group? Just give us a call. The best option for large groups to host a private tour. Customers pay group rate listed above, regardless of number of riders. The price is always $32.50 per person. Guests can pay individually which makes this is a great option for individuals and small groups. Please note that "Book a Seat" tours are open to the public and require a minimum of 8 riders. If you have a group of 6 or more and don't see a time slot that works for you, give us a call and we will open up a "Book a Seat" tour for you. Tipping your driver is recommended and appreciated. If your driver provided a safe, fun and timely experience, a 15%-25% tip is a standard range. Tipping can be added at the time of booking under add-ons. Otherwise, tips can also be added after your tour is complete. The Social Station, LLC reserves the right to charge your credit card for any of the above fees. following your tour. 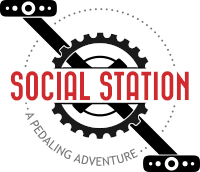 If The Social Station departs and returns on time and undamaged, there will be no additional fees charged to your credit card.